I’ve heard many times that science fiction is about space ships. Way too many times to ignore it, so I wanted to address this massive misconception. Science fiction is about our future potential as a technological civilization. 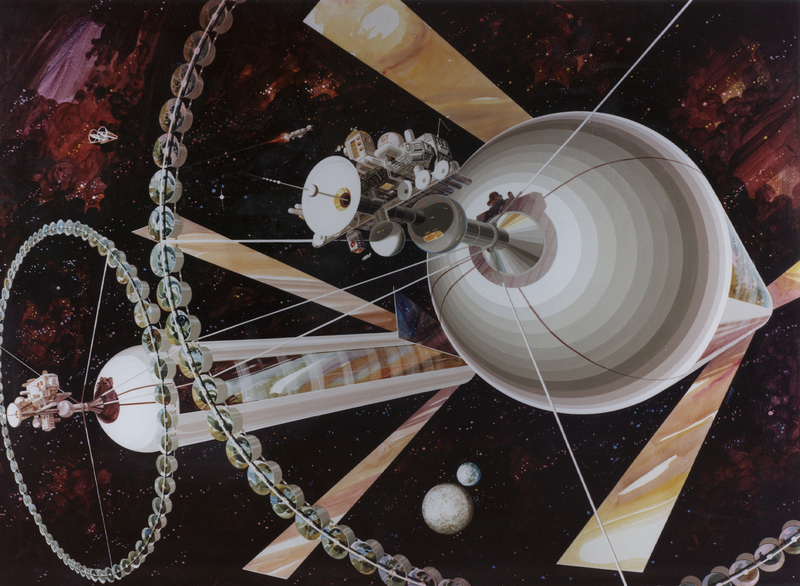 SF stories are told about a future based on the application of (hypothetical or actual) technologies and about what the potential outcome might be, whether good, bad or mad. Real-life spaceships are awesome and the men and women who get blasted into orbit regularly should be considered heroes, but those incredible feats are achievements of science, engineering and exploration. They might have been considered science fiction at the beginning of the twentieth century, but they are real and we’re living them now. Remember, your smartphone was also a matter of science fiction a mere 15 years ago, yet today we’re living out that fact. Add tablets and the Web to that equation. Science fiction as a genre is a way of discovering how the human condition could change, how societies do or don’t adopt certain technologies, and the subsequent culture clashes between pre-, non-, and post-adopters. We get to see how humanity may fare in an increasingly complex world filled with knowledge and technology we don’t have (yet). It explores hypothetical situations and gives hypothetical answers to questions we’re unwilling to face or might not even fully understand, simply because we don’t have the capacity or imagination to do so. SF can at least give us a snapshot, a glimpse of what may be or not be. It is, in short, about a potential future. Whether a plausible or a possible future, is a different question. Time and scale – What happens to us or the universe in the long term? A million or a billion years from now, things will have changed in way we cannot predict or understand. Think about time travel or time manipulation, all those tantalising what-if scenarios, like encouraging Hitler to seek a career as a monk or not asking that girl out back in 91, what would happen to our reality? Evolution and adaptation – Are we the end point? Will we change dramatically? Or are we the stepping stone for something bigger and more powerful like a functioning AI? Telling stories where humanity itself is at stake is the key here. Adaptation of certain technologies – Do we choose to use a particular piece of technology or not? What happens to those who use it? What happens to those who don’t? The social, political and ecological outcomes might vary wildly and we should explore them. Into Inner Space – What do intangible elements, like ideas of dreams and identity mean? Can we explore them or even try to explain them? What if we do and don’t like the answers? Into Outer Space – SPACESHIPS! And yes, science fiction can be about the exploration of space, colonising worlds, discovering new life and the conflicts that would ensue. What will that mean for us? Would it save us or doom us? Stories like The Windup Girl, Brave New World, 20.000 Leagues Under the Sea, Red/Green/Blue Mars, Frankenstein, 1984, Dune and Childhood’s End create wondrous and terrifying narratives aimed at questioning and exploring key aspects of changes to our society, if the scenarios play out. I was born in the late seventies. Back then my family had turn-dial black and white TV with 8 local channels, our telephone was still tethered to the wall and my dad drove an Morris Mini. To visit a friend I had to walk several blocks to knock and ask if he or she wanted to go play, because often they wouldn’t be near the phone. So while I was growing up I dreamed of a future with easier access to knowledge. Today we literally have access to the world from our smartphone, a device so small it boggles the mind how we made that in my short lifetime, and in the immediate future we’ll be facing personal drones, driverless vehicles, 3D-printing in our garages and personal digital assistants that are more like Tony Stark’s “Jarvis” than Siri. We live in the future and the world is only going to move faster. So the role of science fiction is becoming more and more complicated and fascinating, and has to deal with ethics and morals of technological progress by predicting the potential change and fallout from progress. Science fiction is an existential metaphor that allows us to tell stories about the human condition. Isaac Asimov once said, “Individual science fiction stories may seem as trivial as ever to the blinded critics and philosophers of today, but the core of science fiction, its essence, has become crucial to our salvation, if we are to be saved at all. But what do you think of science fiction? Are deeper philosophical musings getting squashed by big shiny tech toys? Let me know and stick around for weekly posts on reading, writing and life in general. And do like, share and subscribe. Stay tuned!